When I first started looking at tablets they were so expensive I really needed to justify my purchase. I wanted something compact, light and portable. It needed to work for my, not just the latest fun gadget. I did a lot of research to find the apps that would help me work with Word and documents, take quick notes, synchronize my calendar contacts and files. After finding out it could do what I needed, I broke down and purchased an iPad 1. It worked for a few years until the next generation iPad was released and the apps started to run slow. I just could take it anymore so it was time for an upgrade. I really wasn’t sure if I wanted another iPad so it was time for round 2 of research. Should I go to an iPad 3 or should I go with an Android or look there is this Microsoft tablet coming out called a Surface. I upgraded my laptop my computer from Windows 7 to Windows 8 and was really impressed with it even though I didn’t have a touch screen. I thought, if this is was it’s like on a laptop then it has to be pretty good on a tablet. So then it was time to wait for me to get my hands on one at a store. I went to the local Best Buy to play with one and loved it. I also realized that it most likely wouldn’t have all the apps I as used to on the iPad because it was a new OS but it does everything I want and more. A full version of Microsoft Office, Skydrive and most of the popular social network apps. Even if the apps were not available, it has a full web browser I can use. What more could I ask for. So I took the plunge and purchased one. I purchased the Surface RT because I had a full laptop for full applications and the battery life of the pro version wasn’t impressive. Once I started using it, I was really happy and realized I made the right choice. More to come in future posts. Thank you for your post. Sounds like the Surface RT is really working out for you. I got one a year ago and it has been my constant companion ever since. I really like the UI and how full-featured the browser is. My favorite app is MS Office and I love how well it works on a tablet. Surface works well for me. Hi Curtis, I Agee with you. MS Office and OneNote are my favorite apps for business. I also love Flipboard when it works and 500px. I love the synchronization between my Surface and my laptop. You are right about OneNote. I am using it now to collect research for a paper I am writing. It is so convenient for organizing content on the fly. I like clipboard as well, but oddly sometimes it seems to forget my settings and I have to have it connect to Facebook to get my profile. The only thing I don’t understand about Surface is why so many people hate it so much. It’s almost creepy how people who have never used, or much less seen, a Surface seem to “know” that it is the worst tablet ever made and that it must be either avoided at all cost or actively dismissed to all those around them. Somehow it is a sin of the worst magnitude that the Surface RT cannot run legacy Windows apps, yet it is just fine that iPads do not run Mac apps. It is also unacceptable that “only” 200,000 apps exist for Surface at the present time even though the app gap is closing all the while. Perhaps after the holiday season, MS will disclose how well Surface sales went beyond projections. Perhaps also, more bloggers that own Surface tablets will post in earnest how much they like their Surfaces. 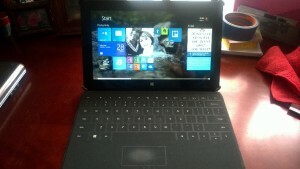 Great post Irvin and I look forward to more post on your time with the Surface RT. I agree with you and Curtis as when it comes to the Surface tablets and other Window 8 tablets they are excellent machines. It amazes that for all the vitriol Microsoft receives for Windows 8 no one has taken the time to realize what Microsoft has accomplished. They have place a full fledge OS on a tablet that runs actual applications not mobile phone applications stretch to fit on a tablet screen. iOS and Android are mobile Operating Systems while Windows 8 is a full OS. As for running legacy apps on Windows RT that is a minor problem that may dissipate as more apps become Win 8 compatible. As for the lacks of apps issue while I would like a few more apps instagram, true google apps and at least another browser I really enjoy operating on a tablet where every link I click does not open a window where I have to select an app to complete the task at hand.